The City Daily Photo theme for September is “Pink”. Click here to admire more incarnations of this hue. From time to time I pass this letterbox — it’s dressed to impress. I hope the rest of the house isn’t so loud..
No-one could ever miss that mailbox. Great for finding the residence. Excellent choice for this theme day.Have a good week! Well spotted. That is really an in-your-face pink. I’m curious about how the house looks.. Cute self made letterbox, really a nice find for this theme! I love this one. Excellent choice. Wow! Nice interpretation of the theme – very eye-catching. I’ll bet I couldn’t talk my husband into painting our box this color. I suppose the postman can never miss this one. Nice pink! 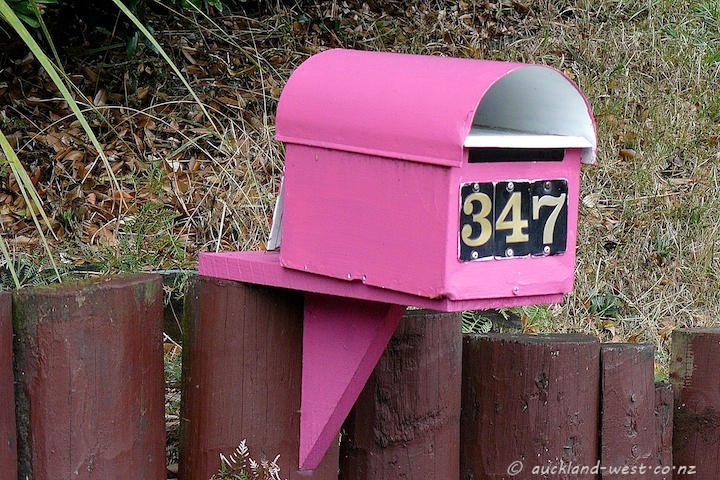 that is one cute little mailbox! That’s Pepto-pink. Great shot for theme day!